About three weeks ago while exiting Wal-Mart by way of the gardening section I spotted a solitary cherry tomato plant that was about four inches tall. I took it home, after paying for it, of course. As the sole caregiver of a wife who has survived two heart attacks and a number of other things happen to her, I don’t have a great deal of spare time. I have no time for a full-fledged garden. 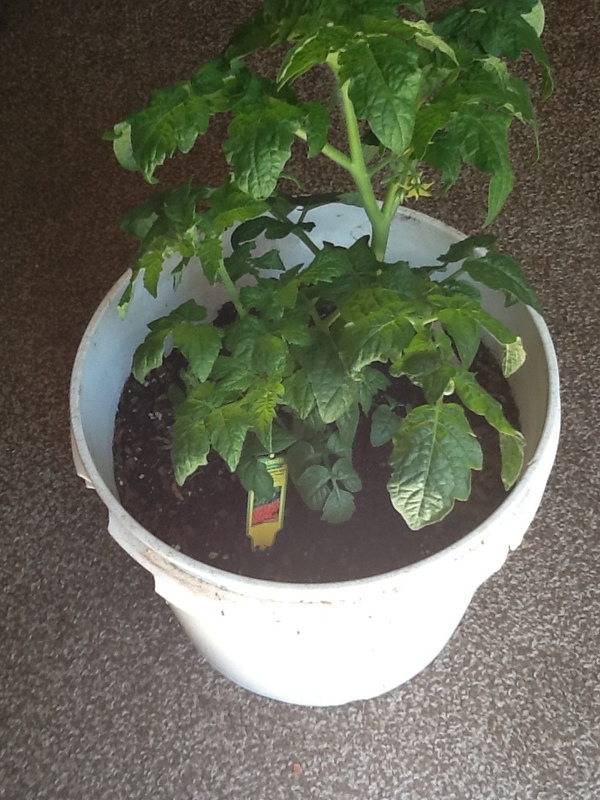 So I transplanted it into an empty baker’s bucket. It took off as though it were a happy plant. I watered it and sheltered it from the heavy Arkansas rains we’ve experienced these past few weeks – almost since we arrived here. We were north of Dallas for about 11 years. On 5 March we relocated to Crossett, Arkansas. That night near midnight Barb had her first heart attack and the battle isn’t over yet.